About this fragrance ~ Warm spicy cinnamon sticks overwhelm this red-hot fragrance. Add this "Superior" Cinnamon to your collection. About this Product ~ Our Reed Gardens™ are the perfect accent to any room, offering an abundance of vintage beauty and fragrance. Each “garden” comes individually gift-boxed in a rich black embossed box with full color product detail. 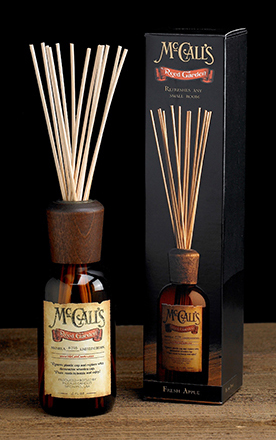 The set includes an oversized amber bottle (8oz bottle), 4 ounces of fragrant oil and set of twelve reeds. Approximate Fragrance Throw Time ~ Reed Gardens offer months of continued fragrance. Flip your reeds often to reactivate the fragrance throw.